Earlier this week, Wolfsburg went off-script by handing Real Madrid a 2-0 loss in the first leg of their Champions League semi-finals. Real Madrid, previously considered one of the favourites to win the Champions League title, is now left in a very precarious position heading back home for the second leg of the match. According to William Hill, Real Madrid is the clear favourite to win on April 12th, as they are currently listed at -450 to win. The problem, of course, for Real Madrid is that they will need a big effort at home to advance against Wolfsburg. At the very least, Real Madrid will need to win 2-0 in order to force extra time in the match. If Wolfsburg is able to notch an away goal next Tuesday, Real Madrid's task will become that much harder as they were unable to score on the road themselves. Wolfsburg, on the other hand, is currently listed at -138 to move ahead to the next round. Wolfsburg in the Champions League semi-finals would be a truly shocking result for anybody but the heartiest of Wolfsburg fans. Real Madrid's precarious position in their quarter-final match has obviously significantly dented their chances of winning another Champions League title. 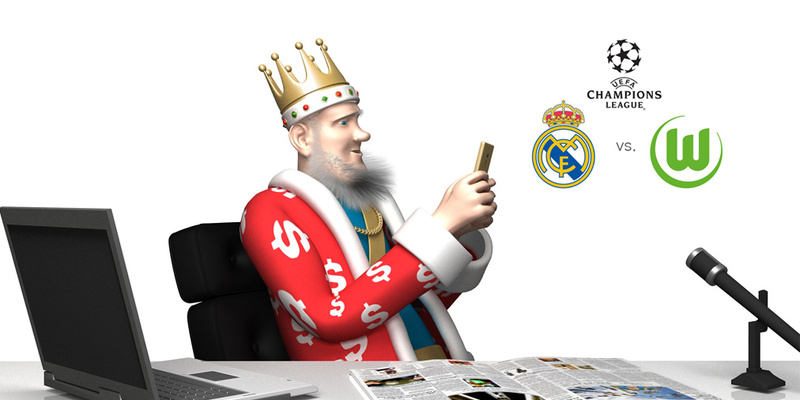 As of this moment, Real Madrid is listed at +800 to win the title, far behind both Barcelona (+163) and Bayern Munich (+225). The good news for Real Madrid fans is that the team certainly has the firepower needed to overcome a two goal deficit. Wolfsburg's side, on the other hand, will be hanging on for dear life as they hope to overcome all of the odds to advance to the Champions League semi-finals.